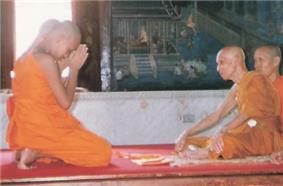 The legitimacy of fully ordained nuns (bhikkhuni/bhiksuni) has become a significant topic of discussion in recent years. Texts passed down in every Buddhist tradition record that Gautama Buddha created an order of fully ordained nuns, but the tradition has died out in some Buddhist traditions such as Theravada Buddhism, while remaining strong in others such as Chinese Buddhism (Dharmaguptaka lineage). In the Tibetan lineage, which follows the Mulasarvastivadin lineage, the lineage of fully ordained nuns was not brought to Tibet by the Indian Vinaya masters, hence there is no rite for the ordination of full nuns. However th 14th Dalai Lama has endeavored for many years to improve this situation. In 2005 he asked fully ordained nuns in the Dharmaguptaka lineage, especially Jampa Tsedroen, to form a committee to work for the acceptance of the bhiksuni lineage within the Tibetan tradition, and donated €50,000 for further research. The "1st International Congress on Buddhist Women’s Role in the Sangha: Bhikshuni Vinaya and Ordination Lineages" was held at the University of Hamburg from July 18–20, 2007, in cooperation with the University’s Asia-Africa Institute. Although the general tenor was that full ordination was overdue, the Dalai Lama presented a pre-drafted statement saying that more time was required to reach a decision, thus nullifying the intentions of the congress. The Buddhist ordination tradition of the New Kadampa Tradition-International Kadampa Buddhist Union (NKT-IKBU) was developed by Geshe Kelsang Gyatso in accordance with the changing needs of modern society. Unlike most other Buddhist traditions, including Mahayana schools such as Tibetan Buddhism, which follow the Hinayana ordination tradition as laid down in the Vinaya and Pratimoksha Sutras, the NKT-IKBU ordination is said to be 'based on' the Mahayana Perfection of Wisdom Sutras. Apostolic succession is considered an essential and necessary concept for ordination, in the belief that all ordained clergy are ordained by bishops who were ordained by other bishops tracing back to bishops ordained by the Apostles who were ordained by Christ, the great High Priest ( Hebrews 7:26, Hebrews 8:2), who conferred his priesthood upon his Apostles ( John 20:21–23, Matthew 28:19–20, Mark 16:15–18, and Acts 2:33). Becoming a monk or nun or, generally, a member of a religious order, which is open to men and women; men in religious orders may or may not be ordained. 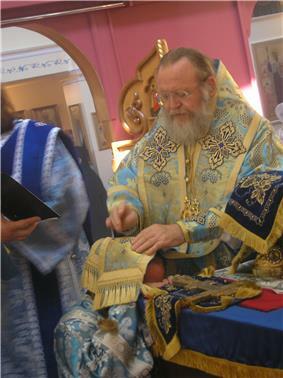 Offices and titles such as pope, patriarch, archbishop, archpriest, archimandrite, archdeacon, etc., which are given to ordained persons for sundry reason, e.g., to rank them or honor them. 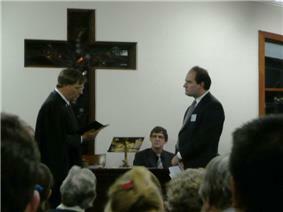 in the Methodist tradition, deacons are also ordained. For most Protestant denominations that have an office of bishop, such as Lutheranism and Methodism, this is not viewed as a separate ordination or order of ministry. Rather, bishops are ordained ministers of the same order as other pastors, simply having been "consecrated" or installed into the "office" (that is, the job) of bishop. However, some Lutheran churches also have valid apostolic succession. Jehovah's Witnesses consider an adherent's deacon ("ministerial servant"). The religion asserts ecclesiastical privilege only for its appointed elders, but the religion permits any baptized adult male in good standing to officiate at a baptism, wedding, or funeral. Religious leaders are usually called Imams or Sheikhs or Maulana. The title Imam refers to someone who leads in prayer and can also be used in a linguistic sense for anyone who leads other Muslims in congregational prayers. Sheikh is an Arabic word meaning "old man" and is used as an honorable title for a learned man; Shaikhah refers to a woman learned in Islamic issues. This title is usually more prevalent in the Arabic countries. The word Maulana is a title bestowed upon students who have graduated from a Madrasah (Islamic theological school) throughout the Indian subcontinent region. Although different Muslim schools, universities or madrasas might follow different graduation ceremonies upon a student's complete of a 4-year B.A. of Islamic Studies or a 7–8 Alim Course, these ceremonies do not in any way symbolize ordination. The Christian priesthood has traditionally been reserved to men. Some claim that women were ordained deacons in the first millennium of Christianity, but their claims are disputed. After the Protestant Reformation and the loosening of authority structures within many denominations, most Protestant groups re-envisioned the role of the ordained priesthood. Many did away with it altogether. Others altered it in fundamental ways, often favoring a rabbinical-type married minister of teaching (word) and discarding any notion of a sacrificial priesthood. A common epithet used by Protestants (especially Anglicans) against Catholics was that Catholics were a 'priest-ridden' people. Hatred for priests was a common element of anti-Catholicism and pogroms against Catholics focused on expelling, killing, or forcefully 'laicizing' priests. ^ "Code of Canon Law – IntraText". Code of Canon Law. Canon 1014. No bishop is permitted to consecrate anyone a bishop unless it is first evident that there is a pontifical mandate. ^ "Code of Canon Law – IntraText". Code of Canon Law. Canon 1014. 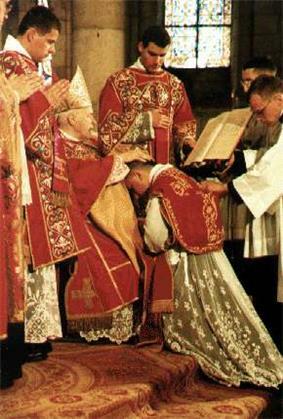 Unless the Apostolic See has granted a dispensation, the principal bishop consecrator in an episcopal consecration is to be joined by at least two consecrating bishops; it is especially appropriate, however, that all the bishops present consecrate the elect together with the bishops mentioned. ^ National Directory for the Formation, Ministry, and Life of Permanent Deacons in the United States (PDF). Chapter 2, No. 77: United States Conference of Catholic Bishops. p. 37. ^ "Orthodox Statements on Anglican Orders"
^ Leo XII. "Apostolicae Curae". Retrieved 20 September 2013. ^ "Beliefs—Membership and Organization", Authorized Site of the Office of Public Information of Jehovah's Witnesses, As Retrieved 2009-09-01, "Jehovah's Witnesses have no clergy-laity division. All baptized members are ordained ministers"
^ "Russian Federation Federal Law", Chapter 1, Article 3, Paragraph 7, as cited by Authorized Site of the Office of Public Information of Jehovah's Witnesses, As Retrieved 2009-09-01, "Ecclesiastical privilege is protected by the law. A clergyman may not be prosecuted for refusal to testify on circumstances that became known to him during confession." ^ "Who Are Jehovah's Witnesses? ", Authorized Site of the Office of Public Information of Jehovah's Witnesses, As Retrieved 2009-09-01, "Who Are Jehovah's Witnesses?...The worldwide organization is directed by an unpaid, ecclesiastical governing body serving at the international offices in Brooklyn, New York." While Buddhist ordinations of monks have occurred, the more notable ordinations of openly LGBT novitiates have taken place in Western Buddhism.
. The ordination of women in the latter half of the 20th century was an important issue between Anglicans and Catholics since the Catholic Church viewed the ordination of women as a huge obstacle to possible rapprochement between the two churches. Evangelical Presbyterian Church and the Christian Reformed Church in North America ordains women at all levels including deacon, priest and bishop. Other denominations leave the decision to ordain women to the regional governing body, or even to the congregation itself; these include the The Lutheran Evangelical Protestant Church ordains women as deacons, priests and bishops. The Episcopal Church in the United States of America ordains women as pastors, and women are eligible for election as bishops. Evangelical Lutheran Church of America has ordained women since 1932. The United Church of Canada The  Her message to her fellow judge Barak in fact affirmed the male leadership of Israel. neither did she lead the military.